Production of Ukrainian defense holding group «Ukroboronprom». 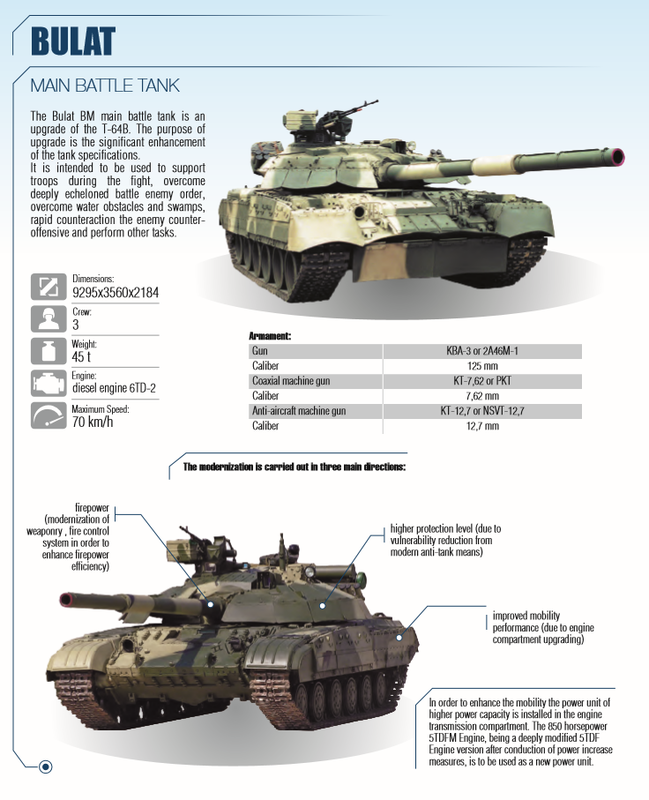 Main battle tank «Oplot» is intended for combat operations in offensive оperations and defence, day and night, in different climate and road conditions, as well as in water and during using of weapons of mass distraction by enemy. 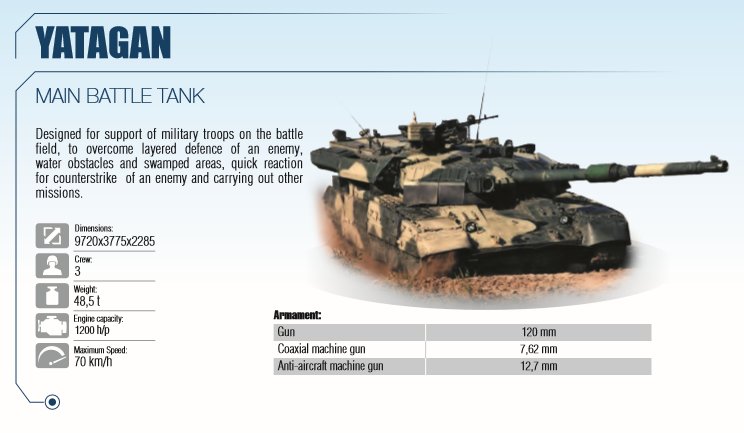 Main battle tank «Yatagan». Designed for support of military troops on the battle field, to overcome layered defence of an enemy, water obstacles and swamped areas, quick reaction for counterstrike of an enemy and carrying out other missions. 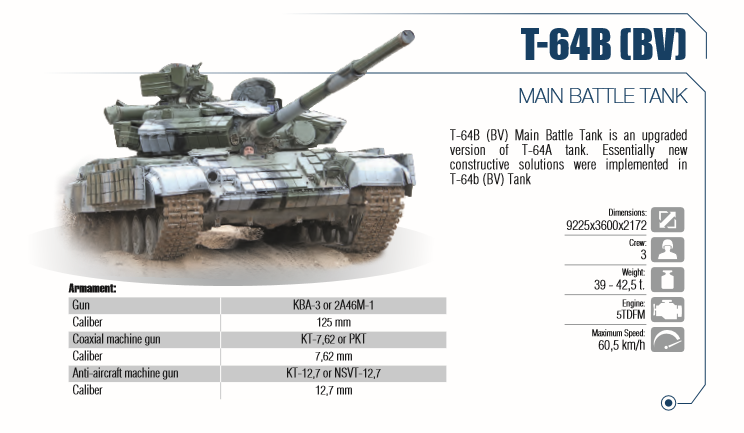 The Bulat BM main battle tank is an upgrade of the T-64B. 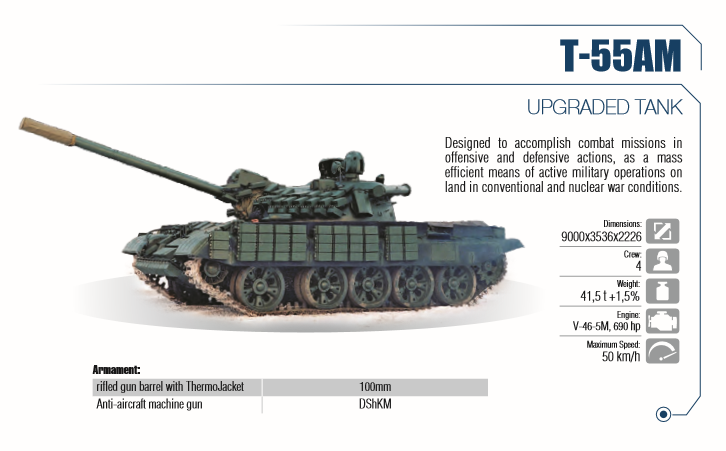 The purpose of upgrade is the significant enhancement of the tank specifications. 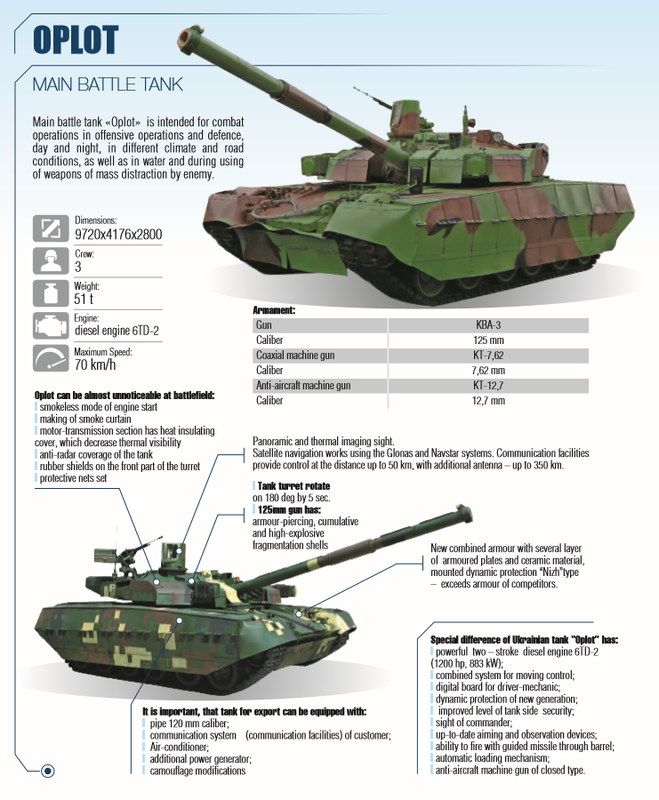 It is intended to be used to support troops during the fight, overcome deeply echeloned battle enemy order, overcome water obstacles and swamps, rapid counteraction the enemy counteroffensive and perform other tasks. 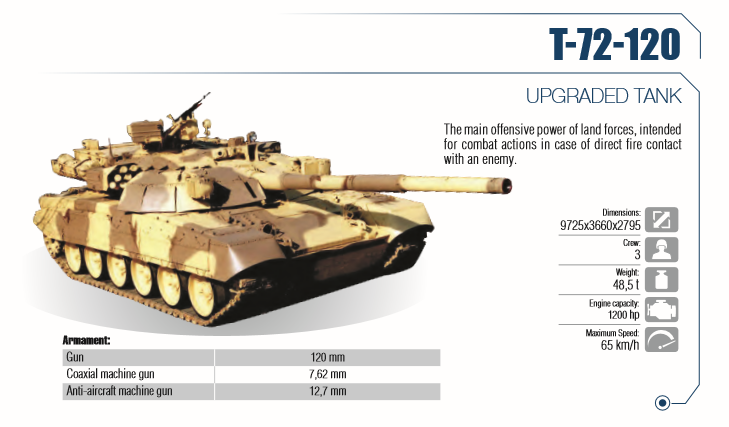 T-72-120. The main offensive power of land forces, intended for combat actions in case of direct fire contact with an enemy. 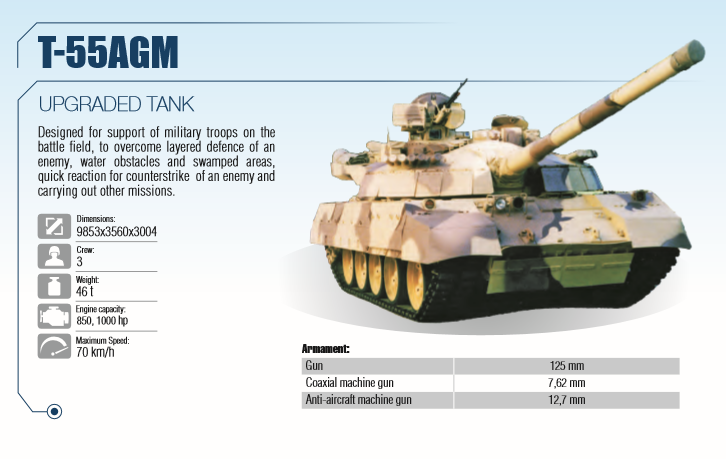 T-72AG tank is combat tracked vehicle, which has powerful missile-artillery armaments, reliable armored protection and high maneuverability. 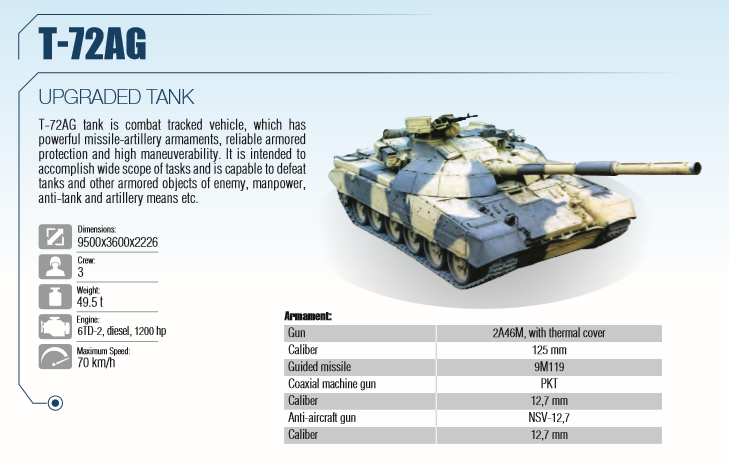 It is intended to accomplish wide scope of tasks and is capable to defeat tanks and other armored objects of enemy, manpower, anti-tank and artillery means etc. T-55AGM. Designed for support of military troops on the battle field, to overcome layered defence of an enemy, water obstacles and swamped areas, quick reaction for counterstrike of an enemy and carrying out other missions.